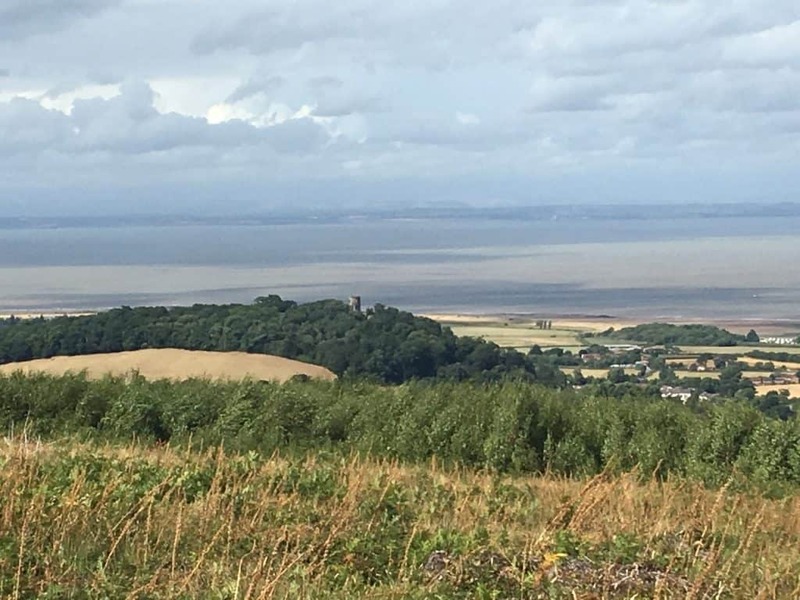 Somerset is known for many things including the Glastonbury Festival, cider, cricket and the Britain’s oldest preserved skeleton (Cheddar man). Aside from all of that, there are some beautiful walks to take in with stunning coastline and historic sites as well as Britain’s tallest gorge. 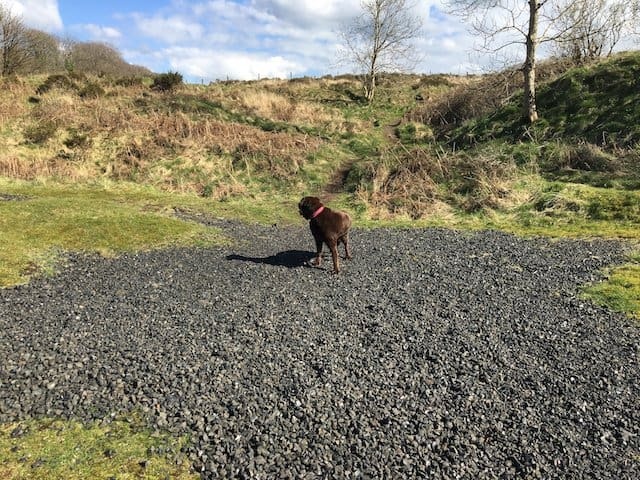 We have selected some of our favourites that have previously been well trodden by our namesake chocolate Labradors Oscar and Hooch, here are nine walks they loved. Part of the Mendip hills, Crook Peak sits over on the west. Set in over eight hundred acres this walk had it all. You can start from either side of the hill, both a lovely but for a longer walk start at the Kings wood car park. This is situated at the A38 end of Winscombe hill. Be aware the car park is small and can be busy especially when the weather is favourable, there is also limited parking on the road. People come and go all of the time, so spaces can become free quite quickly. If you walk from the car park straight through the woods and up a hill this will quickly bring you out to open grassland where you will see the walk ahead. There are often horses and cows grazing here so keep your dog well under control. You will then pass a house on your right and head up another hill (steep and slippery in the wet). At the top of this hill you will see a viewpoint and map to your left. This is a great spot to take in views of Cheddar and beyond. You can then carry on towards the peak which you will see in the distance, something akin to the top of a witch’s hat. The path is very straight, and you will have more downhill until you reach the peak where a very short final ascent will bring you to the top. The views here are breath-taking with the Coast and Wales on one side, and Glastonbury Tor rising up on the other. You can also get a bird’s eye view of stationary traffic on the M5 during the summer months! There are lots of other routes to this walk and you can continue down the other side of the peak and circle back. We would thoroughly recommend taking in the New Inn Pub situated in Cross which has a footpath to the left of the pub which will bring you onto the edge of Kings wood. If you plan to eat at the pub and want to be inside, then you should book in advance. Definitely one of our favourite dog walks. 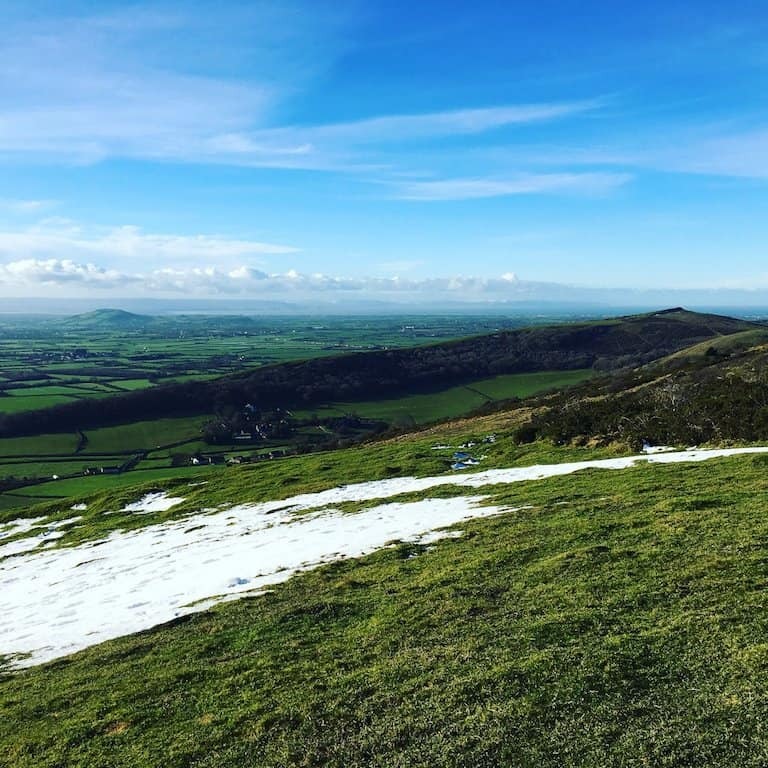 The Quantock hills are an area of outstanding natural beauty and offer many different dog walks that you and your dog will love. 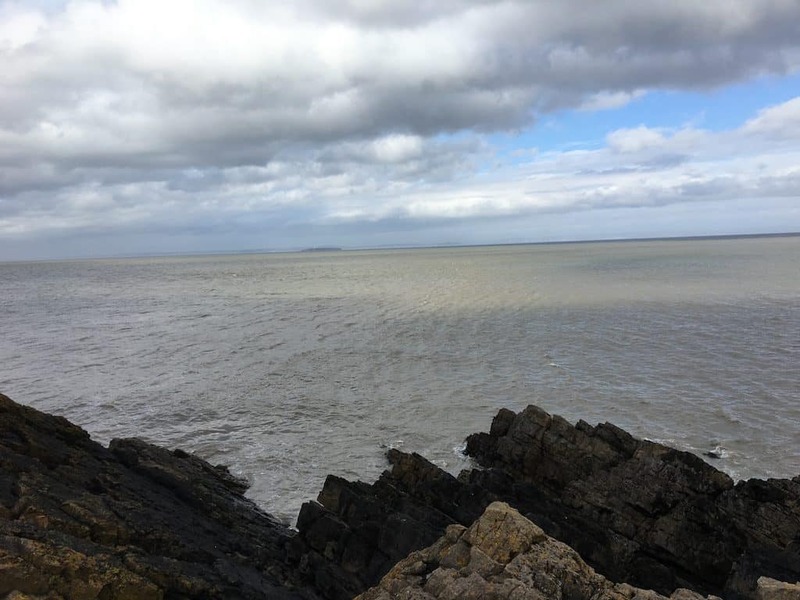 You can take in coastline views around Kilve or woodland walks from Holford. The views from the top are spectacular. We haven’t recommended one walk in particular as there are so many to choose from. A couple of good starting points are either Nether Stowey or Holford. You can also walk between the two villages. If you head into Holford you will see a car park from which you can follow a stream into the woods. This will continue on and any water loving dogs will have great fun all the way along. In Nether Stowey there is a Post Office with a café that serves good coffee and very good value waffles if you want to refuel after a long dog walk. Dunster sits right on the edge of Exmoor National Park, a lovely village full of gift shops, pubs and cafes alongside Dunster Castle. If you have time, then you should take in the gardens of the castle where dogs are welcome. Best place to park is Dunster Steep car park which is on the left just before you come properly into the village. You can then head down the hill towards the water mill and walk along Mill Gardens until you come to the Gallox bridge (dating back to the 15thcentury). From the bridge you can head across the footpath (ignore the path to the left) and walk up into the woods. This path continues for miles and if you can maintain your bearings you should manage to walk through the woods and then out onto the top of Exmoor. You should then head back in a circle towards Dunster where you should pop out where you started (all being well!! ), Worse case you dog walk may end up as a bit of an adventure and an even more well-earned pint or piece of cake! Once back in Dunster there a lot of places to eat and drink, the small National Trust café near the mill is nice on a summer’s day with a lovely garden. The Luttrell Arms bar does a decent lunch and has a good selection of ales. Mentioned in the legend of King Arthur, the Tor is shrouded in mystery. The monument at the top is St Michael, a church built in the 14thcentury which replaced the original wooden church that had been destroyed by an earthquake in 1275. 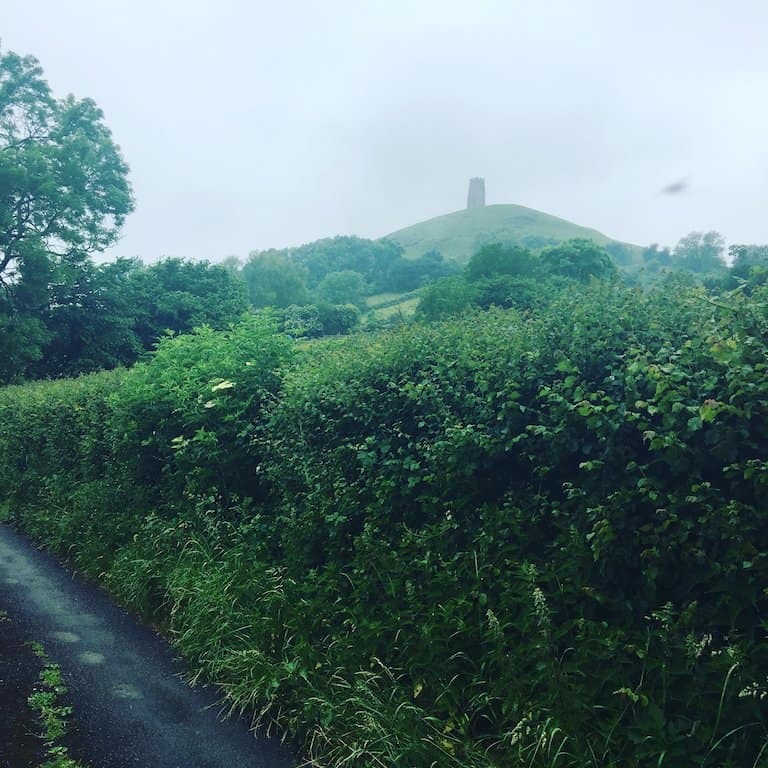 You can start the dog walk in Glastonbury and follow signs up to the Tor, this is recommended as parking around the base of the Tor can be difficult. The walk up the hill can be steep for some but there are points you can take a break if it is too much! 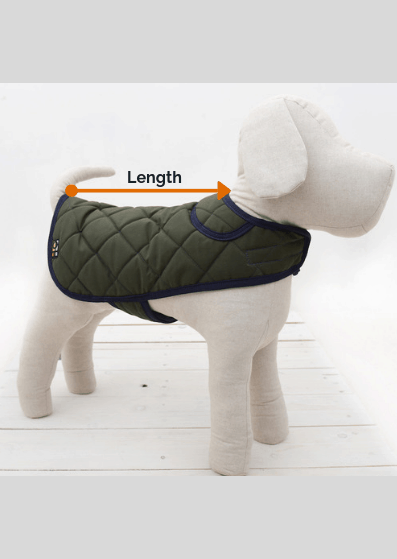 Your dog should enjoy running up and down the terraces (interesting fact, no one actually knows how these were formed) while you catch your breath. At the top you can enjoy the ambience of Celtic mystery and the knights of the roundtable whilst taking in views after climbing just over five hundred feet. 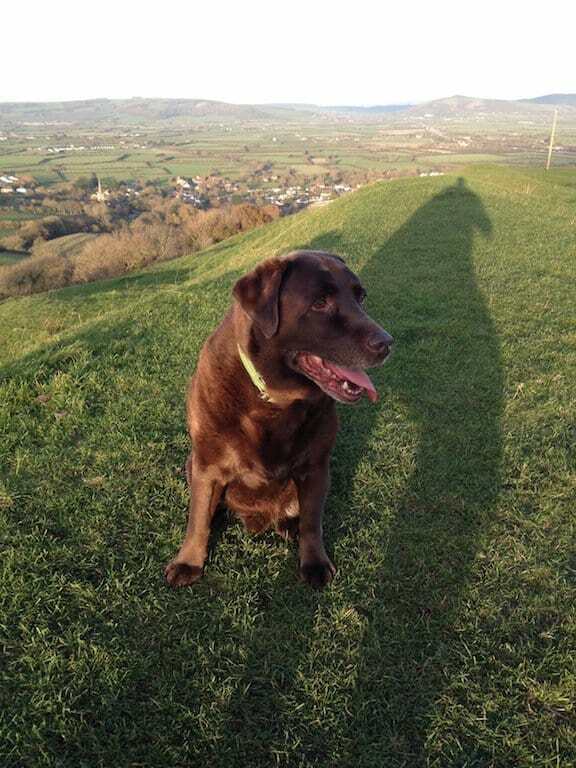 You will get great views of the Somerset levels and beyond as well as Glastonbury below. Sitting between Weston Super-Mare and Burnham, Brean down rises up just over three hundred feet and juts out of the Somerset coastline. Most enjoyed outside of summer when the usual hustle and bustle of the nearby holiday camps has died down. You can take in a walk along the miles of beach leading up to the Down, you can park on the beach or alternatively use the two car parks at the very end of the road leading to Brean Down. Be warned the beech is very muddy the further out you go towards the sea so wear appropriate footwear and be careful you dog doesn’t get stuck in the mud. There are steps leading up to the down and then you should turn left to head towards Brean Down Fort. The walk to the fort is approx. one and half miles, there are shear drops on either side of the Down and so dogs should be under close control (and young children!). Depending on the time of year you visit, be prepared for windy conditions. Once you reach Brean Fort there are lots of places to take shelter from the wind. Brean Fort dates back to the bronze age and was further strengthened with the addition of guns to protect Bristol and Cardiff. Depending which way you walked along Brean Down, you can swap sides on the way back to make it a more interesting dog walk. The café at the bottom of the Down isn’t bad and there’s lots of seating inside and out (although at the time of writing dogs are not allowed inside). Out on the Somerset levels between Wedmore and Glastonbury the Westhay Nature Reserve is a haven for bird lovers. On driving on the main road from Wedmore towards Glastonbury you will pass Sweets Tea Rooms on your left, you should take the left had turn immediately after the tea rooms. Carry on this road until you come to the nature reserve. For dog walkers this is an interesting and pleasant walk with lots of different nooks and crannies to explore. There are bird watching huts you can go into and lots of information about the local wildlife. Be aware that sometimes there are Exmoor ponies grazing here so dogs should be kept under close control. As the reserve is there to protect the local wildlife dogs should always be on a lead. There are no bins for dog waste, so any should be taken away. If you fancy some lunch/dinner after the walk, then The Swan in Wedmore is a reasonable choice or Sweets Tea rooms. The Knoll can be viewed from miles around and is a distinctive hill that can be seen from the M5 and the local railway lines. It stands at over 400ft and is situated between the villages of East Brent and Brent Knoll. There are two dog walks you can take up the Knoll, one starts in East Brent and the other in Brent Knoll. For the East Brent walk head down Church Rd and park near the church. A footpath passes the First School and takes you to the base of the hill. You can then walk straight up the hill and take in the spectacular views. The Brent Knoll side walk starts in Brent Knoll, head up church lane (turning into Hill Lane) and you will see a farm on your right and a small car park on the left. Park in the car park and then cross the road and through the gate passing past the house and farm on your left. Keep walking along the path until eventually you will reach the steps up to the top. This is a slightly gentler walk then the East Brent side and has well maintained paths. Well behaved dogs should be fine off the lead as all farm animals are behind fences. When you get near top of the knoll there may be grazing animals so beware. The views at the top are great with a complete view over the levels and out to Wales and the sea. To finish this dog walk you can stop for a well-earned drink or snack at the Red Cow in Brent Knoll. Priddy is a small village past the top of Cheddar Gorge, driving up the Gorge you will pass two turns (one for Gliding club and one for Westbury Sub-Mendip), the third turn towards Priddy is the one you should take. Keep going until you will see a left turn at the crossroads with the Hunters Lodge pub on your right. Stockhill Woods is on the right-hand side where there is plenty of parking. 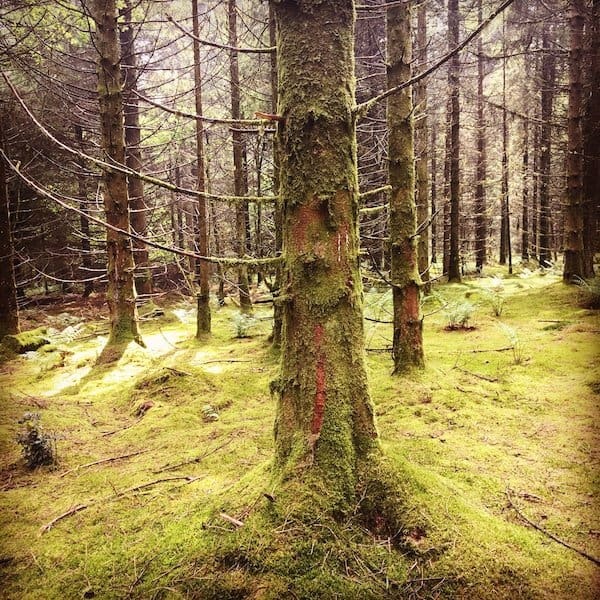 The woods are pretty all year round with well-marked out footpaths. You can venture into the woods and there are some lovely spots that you dog is sure to enjoy exploring. If you want a spot of lunch after your dog walk then we would recommend stopping at the Queen Victoria pub (in Priddy) or the Bath Arms (in Cheddar). 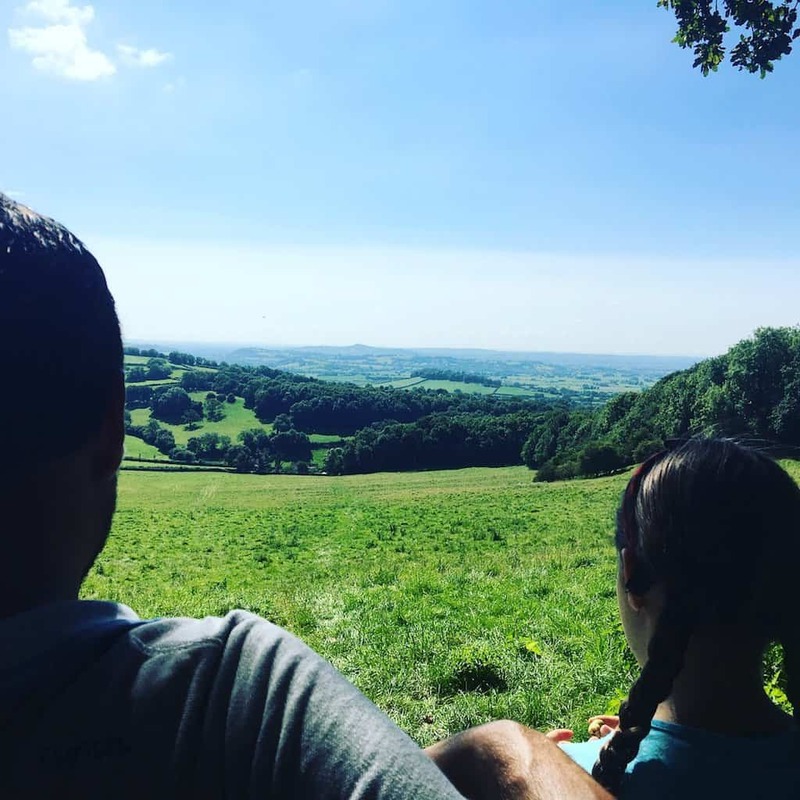 You can take a walk up the Gorge from the bottom, however we would recommend driving up the Gorge (whilst taking in the views) and the parking by the National Trust woods near the top (you will see a layby on the left and opposite), both are free. You then have the choice to go left or right. If you follow the path to the left you will get some great views and eventually end up popping out at the top of Cheddar village. If you go right, you will take in views from the other side of the Gorge and also get views over the other side of Somerset. Both walks are great for you dog and both are interesting. Bear in mind the are some very sharp drops on both sides of the Gorge and so caution near the edges is advised. Once in Cheddar there are a plethora of tea rooms and cafes to choose from. For more articles like this sign up to our newsletter here.